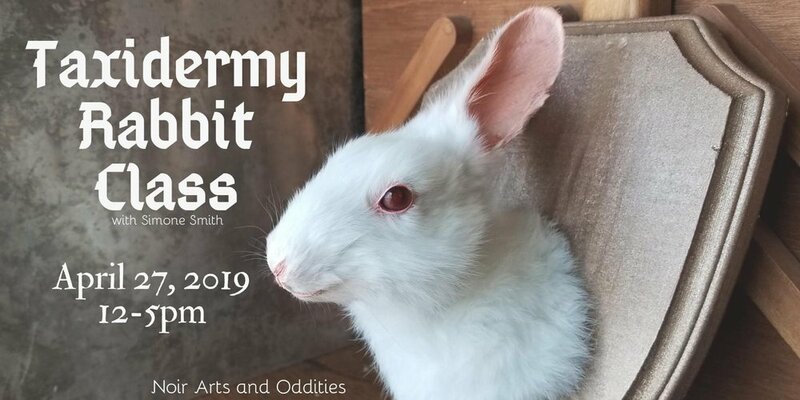 Join us for a fun afternoon learning rabbit taxidermy with local Taxidermist Simone Smith. In this class students will create a rabbit shoulder mount that will hang on a plaque. The class will cover the entire process from skinning the animal to fleshing, preserving, mounting, and finishing techniques. In this class students will learn to mount rabbits on professional forms and focus on facial details and ear techniques. Students that have taken our beginner’s taxidermy class will enjoy delving further into the focus of this class, but no experience is necessary and all experience levels are welcomed. Students will leave with their completed rabbit and the knowledge and confidence to create future mounts. All materials including the rabbit are provided and students are encouraged to bring any props or accessories they’d like to incorporate into their piece. We will be covering the entire process from start to finish including skinning the animal, gore is minimal but this class may not be for everyone. No dangerous chemicals are used in this class. Gloves will be provided, students may want to bring an apron if desired. A notebook, pen, and camera are recommended for taking notes and a bag or box to safely carry your mount home in. The rabbits are disease-free and are not killed for the purpose of this class. The rabbits are provided, please don’t bring any dead (or live) animals to class. You must be 18 years of age to attend this workshop. What can I bring to the event? Please feel free to bring a drink and snack since this is a 5-hour class. There will be opportunities for breaks and you can grab a beverage over at Blip Roasters. If you have questions about the workshop please feel to contact us at info@noirartsandoddities.com and use the subject of the title of the workshop, e.g. - "April Taxidermy Rabbit Class". There are no refunds however if you should not be able to attend for whatever reason, please email us at info@noirartsandoddities.com ASAP so we can assist you. As mentioned above, please contact us immediately as soon as you know you cannot attend and we will do all we can to accommodate your situation.